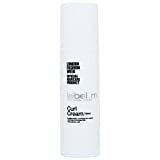 label.m Curl Cream with Jojoba, Bran and Sunflower extracts soothe and protects curls. The innovative Enviroshield Complex, exclusive to label.m, shields against heat styling and UV rays, boosting shine. Apply to damp hair and comb through. Diffuse or air dry. Can also be applied to dry hair to revive curls.